Please join me in helping “camouflage” a dingy stretch of Queens Boulevard one third of a mile long. Over a three day period, between 150-250 volunteers are needed to stencil and paint a design along a pedestrian walkway and bike lane at Queens Plaza 1,584 feet long. 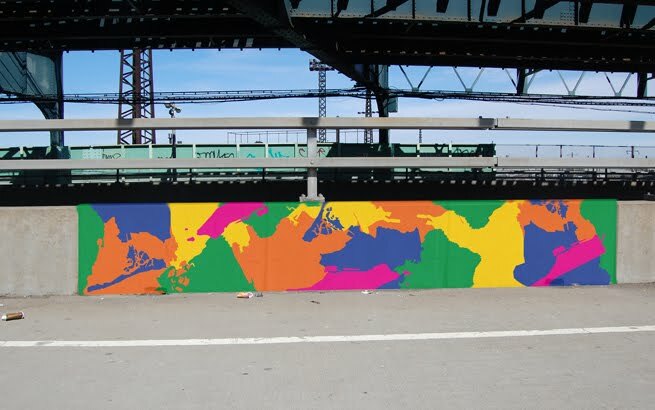 The design, NYCamo, is a brightly colored camouflage pattern based on the shapes of the five boroughs of New York City. The commission was awarded by the NYC Department of Transportation Urban Art Program. This entry was posted in NYCamo, Queens. Bookmark the permalink.